I have compiled all of the best packing information to help you go abroad and return without incurring the cost of an extra suitcase of things you never used. Your comfies—wearing sweatpants outside of home may not be as warmly accepted abroad, but you will want a pair for chilling in your abroad dorm/home-stay. Bring clothes you can layer as needed. Gift for your host family—if a family is housing you for several months, it pays to show thanks. One nice outfit—check what is accepted in your host country. Guys: a bow-tie is a good investment and can transform your black suit into a tuxedo. Travel-size pack of tissues—there are places that don’t keep toilet paper in the restroom. Jewelry, a laptop, student credit cards, check book, cash, iPod, traveler’s checks, camera, etc. Lay out what you’re going to pack. Now divide it in half. Bring clothes that you will wear every day. No “I might wear this.” If you think that, don’t pack it! You can always buy from local stores. You get new clothing and don’t stick out like a sore thumb. 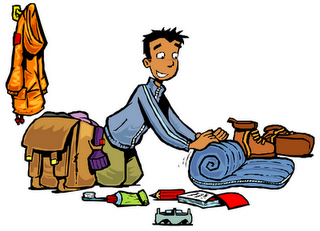 Rolling your clothes saves more room than folding then/laying them flat in your suitcase. Pack underwear and socks last—they fit anywhere! Check http://www.weather.com/ for the weather in your country. Use the Returnee-Alumni Contact list at the I-House for any region/program specific questions. Make 3 photocopies of the INFORMATIONAL pages of your passport. Carry one in your bags but separate from your passport. Leave one in your home in the U.S., and leave one at your home abroad. I’ve known people to keep a copy in their wallets, purses, even in their shoes! Exchange your money before you get to your country of destination. More often than not, local banks will give you the best exchange rate, and the lowest conversion fees. Next Study Abroad is the Gift that Keeps on Giving!